Here's the last recipe from our themed "I'm a Giant" party. 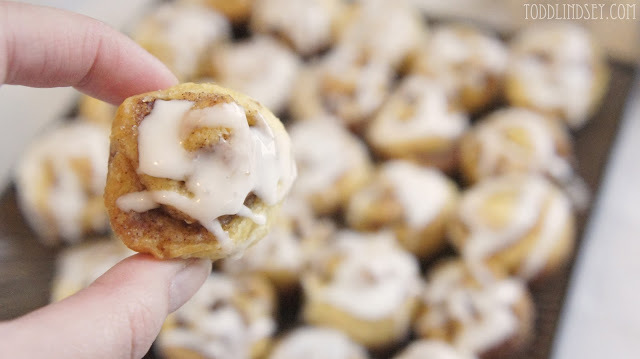 Aren't these cinnamon rolls super cute? You could even pop them on lollypop sticks for a handheld treat! But what I love most about this recipe is how easy it is. No yeast. No dough making. Just canned crescent rolls! It doesn't get much easier than that! 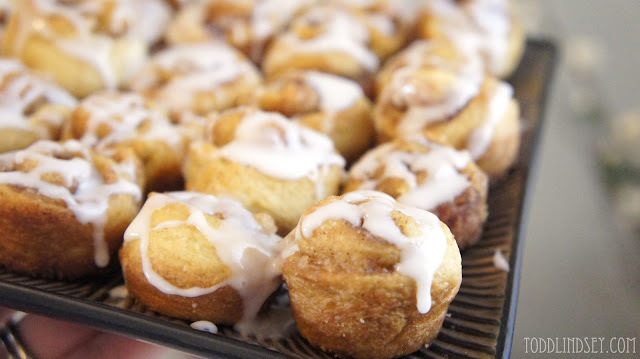 Preheat the oven according to package directions and spray a mini muffin tin with nonstick spray. Unroll the dough on a flat surface, pinching all the triangles together to form one rectangle. Smooth seams together with a rolling pin, until the dough is about 1/4 inch thick. Brush with the melted butter and sprinkle as much brown sugar and cinnamon as you want over the top. Carefully roll the dough into a long log. Cut into 16 even slices and place each piece in a mini muffin tin. While the rolls are in the oven, whisk all the icing ingredients together until smooth. 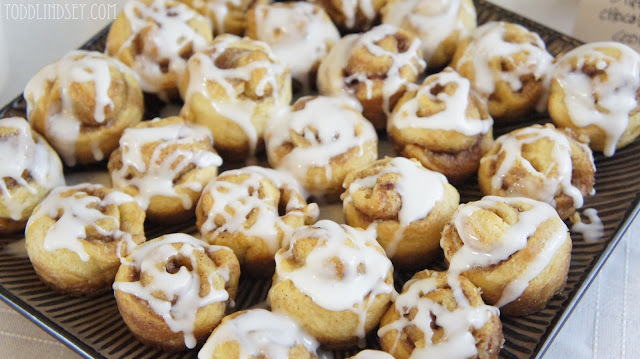 Drizzle icing over warm cinnamon rolls. I want some of these right now, Lindsey. ;) These look so delicious...yum! Hi Lindsey! I found you on the Tuesday To Do party. Cinnamon rolls are my favorite things in the world. These are adorable and they look delicious! Totally trying these. Thanks for sharing! These are SO cute! And look absolutely delish! Thanks for sharing! Great idea, I'm going to definitely make these with my daughter! I love how they use premade dough, much easier! Oh My Gosh! I just love these little rolls. Thank you for sharing these at the In and Out of the Kitchen link party. I am going to feature these in the Top 10 of the In and Out of the Kitchen link party in a post that will go live on Monday morning! Thanks for sharing. Those are adorable! Unfortunately, my dd can't have it, but it is a great idea to try to make my own recipe. She likes to have a BFG Roald Dahl breakfast party every year and this would be a cute addition to it or her Alice in Wonderland party. I would love for you to share and link up at my weekly TGIF Link Party if you haven't already this week. The party is open every Thursday night and closes Wednesday's at midnight. 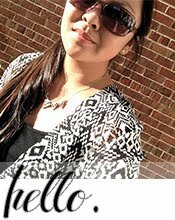 http://apeekintomyparadise.blogspot.com/. Hope you will join us!